OK, Let us go back to Thursday afternoon when I found out Uncle Ed's Mays funeral was set for Saturday at noon. That spun our alternate weekend arrangements into motion. I had already scoped out tickets to fly to Ohio and Thursday afternoon I booked them. I would fly to Ohio and arrive Friday afternoon and return to DFW early Sunday. Pastor JJ Stevens was very gracious when I told him earlier that I would probably have to miss some of the revival to travel to Ohio for the funeral. With the reservations set, I let him know that the plan had been made. I really appreciate his kindness in allowing me to keep the commitment that I made to Uncle Ed 15 years ago. We spent most of the afternoon and evening getting me prepared to go. After church we finished up and tried to get some rest. Kelly Jo took me to DFW airport Friday morning and I had a good flight to Cincinnati. Dad met me on the way to the Lazy OD Ranch at a little Mexican restaurant called Acapulco. Have you ever heard of it? My, my, my! That was so good! Thank you, Dad! I determined I would go back very soon. Friday evening was spent at the church practicing a song for the funeral with my brother Steve and at Odie's Beach House trying to get ready to preach. Speaking of Odie's house, I appreciate her offering to allow me to stay there. That was so nice of her. It was a little weird though. This is the first time I have walked into the house without a project or 13 projects staring me in the face. It made me look at the house in a whole new light. I realized the house is a very nice and livable home. I think that describes it. It is livable. I am incredibly pleased with what we all created together. I enjoyed a little time there by myself even though I was without my girls and it was a busy 36 hours. Going into the beach house. Really relaxing the the living room. Chilling in Odie's yellow chair. Checking out Odie's million dollar shower. Working on a sermon at the kitchen table. 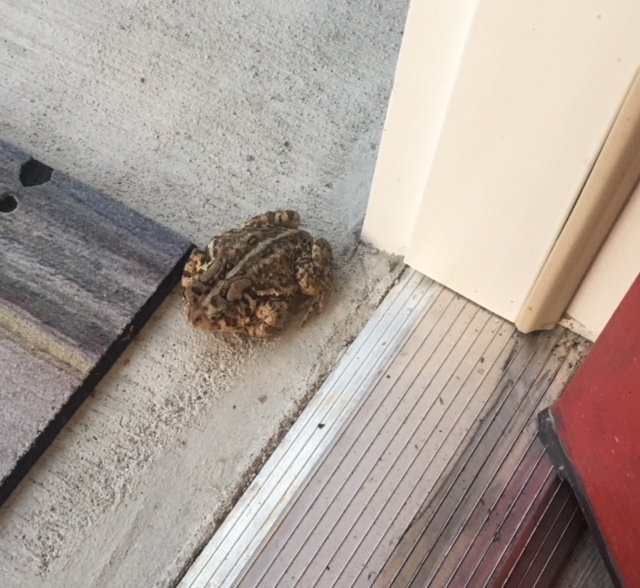 This is Odie's guard frog. It sits at her front door. Sometimes during the day and sometimes overnight. I suppose it wants to keep the bugs guessing. Bugs that guess wrong do not last long! Once the funeral and dinner were finished we squeezed in one more little trip to Acapulco. Thank you, Jay and Theresa. I was up at 2:10 central Sunday morning so I could make my way to Cincinnati for my early morning flight to Dallas/Ft. Worth. I rarely fly without Kelly Jo. She is my fat man buffer on a plane. The first flight was completely booked with only one person not showing up. It was the seat next to me! Sunday's flight had plenty of room and I had a seat beside me open again! The two Sunday services at Victory Tabernacle were really good. I think they capped off revival in fine fashion. I posted pictures yesterday from revival. Here are a few pictures from Sunday to give you incentive to go look if you have not see the post. Monday morning I finished up the repair to the busted BoggsMobile air line that I told you about in a rambling post last week. I am posting this picture from my records. These are part numbers for 1/4" DOT brass unions and also brass nuts from Fleet Pride. After the repair, but before we left, KJ fetched some tacos for lunch and doctored them a little. Very good. As you may remember we were supposed to preach three nights in Gainesville, Texas this week but the meeting had to be postponed. The way events played out, the days off come as a welcome break after a crazy 6 weeks or so and a crazy 8 weeks ahead. God knows much better than I do. We love parking in Gainesville, Texas and it is right on our way to Oklahoma City for Bro. Rickey Searcy's Annual Fellowship Meeting beginning Thursday. I called Pastor Dennis King Monday morning and asked if we could stop off in Gainesville a couple of nights. He has told me before not to bother asking because it is always available for us, but my Dad and Mom taught me to be polite. That is where we are this morning. I have been working on book work and sermons and the girls have been staying busy too. KJ prepared homemade tacos last night and they were the best as always. That wraps up our weekend. Thanks for joining us. Have a great day.